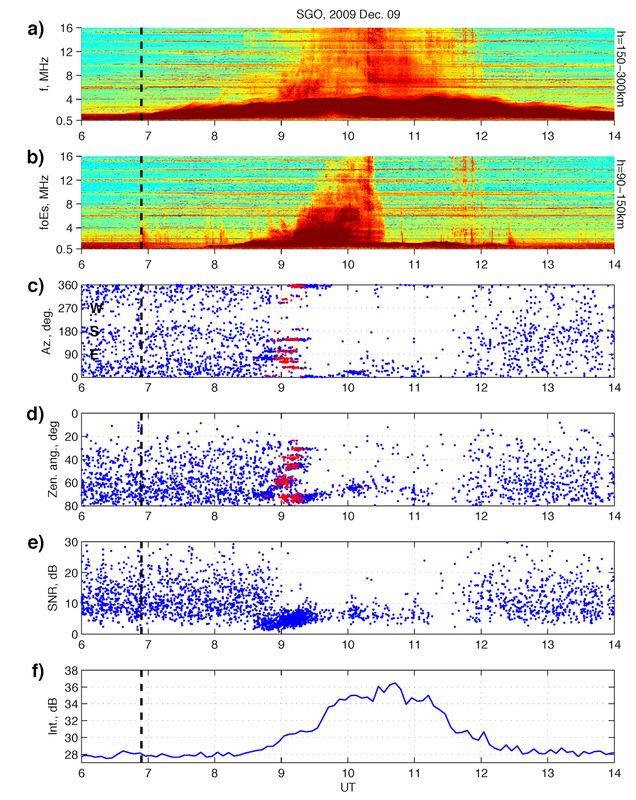 Sodankylä Geophysical Observatory: Norway spiral revisited! On December 9, 2009, I was in the right place at the wrong time, i.e., about to start my radar experiment at the EISCAT control room. People started to call me repeatedly "how did you do that?!" A huge spiral shaped light phenomenon had appeared in the eastern sky of Tromsø, clearly visible to a naked eye. Holy s***t! Is that a distant galaxy seen through a worm hole or what?! The event lasted for a few minutes and people were able to take photos and even video footage on it, posted promptly to the YouTube among other media. It turned out, however, that the spiral didn't actually take place in Norway at all, but above Kola Peninsula, Russia. 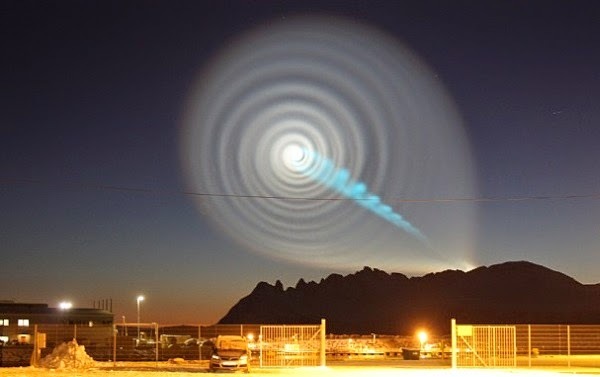 The spiral itself was caused by exhaust gasses of a failed Russian "Bulava" test missile precessing like a garden hose. The gas trail was illuminated by the sunrise, making the spiral nicely visible against the dawn skies of Northern Norway. SGO ionosonde (a-b) and meteor radar (c-f) data showing ionospheric effects of the missile explosion. Vertical dashed lines indicate time of the explosion occurred 500 km to east. Kozlovsky reports: "The Russian military Bulava missile is a three-stage solid propellant 36-tonnes ballistic rocket. On December 9, 2009 a test launch was performed from a submarine located in the White Sea. Because of a technical problem with the second stage, the missile was self-destroyed near 200 km altitude over the Kola Peninsula (north-west of Russia) soon after the launch. It happened at about 07 UT, which corresponds to sunrise. Illuminated by the Sun the combustion products of the fragments of the rocket formed a spiral, which was observed on the dawn sky in northern Norway."